In 2010, we were approached by Shepley Bulfinch (one of the oldest architectural firms in the US, located in Boston), to design a 22" x 34" poster announcing their fellowship program. Thinking about the given year (2010), and the theme of architecture, we decided to explore the notion of Roman numerals. After all, there seems to exist an fascinating tradition of using Roman numerals on buildings, chiseled in marble – and we thought it would be interesting to try to strip these numerals of their classical (and neo-classical) aesthetics, and display them in an unexpected way. We realized the angular shapes of the numerals, MMX, would make quite a good starting point. Considering the notion of an educational design program, we thought it would also be interesting to refer to movements such as De Stijl and Bauhaus – movements that, each in their own way, had strong didactic and pedagogic ambitions. That's why we decided to refer, in our design, to the constructivist language of those particular movements, using geometric shapes and primary colours. In fact, the poster almost becomes a educational tool, demonstrating how primary colours (red, yellow, blue) can be employed to create secondary colours (purple, green, orange). 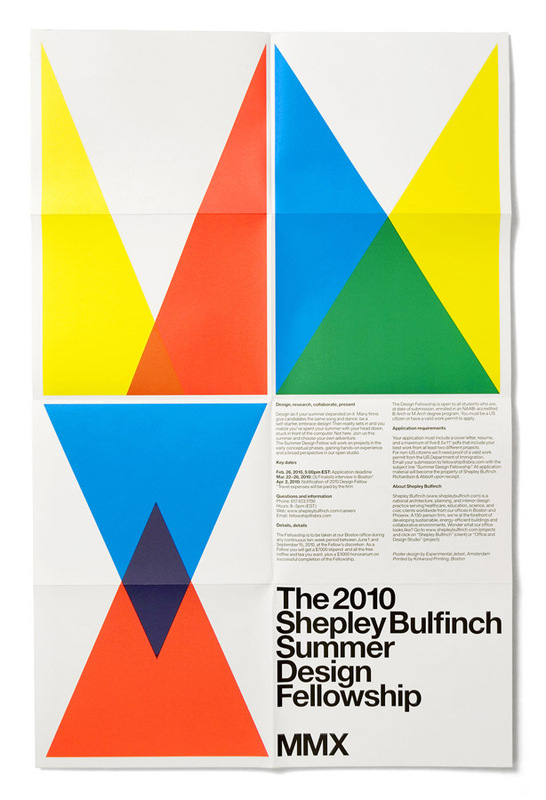 In short, the poster displays the numerals MMX, transformed into a composition of brightly coloured triangles. Since the folds already provide quite a static, symmetrical grid to the poster, we decided to make the two Ms slightly different from each other, trying to add some asymmetry to the composition (in an attempt to stay away from neo-classicism as far as possible). Part of the posters were kept unfolded, while the rest of the posters were folded, and sent to universities and art academies as brochures. The above piece is actually part of an ongoing series of annual posters commissioned by Shepley Bulfinch. Dan Vlahos was responsible the first fellowship poster, in 2009. We designed the poster in 2010. The one in 2011 was created by Pentagram, while the 2012 edition was made by Non-Format. And if we understand well, the poster in 2013 will be designed by Build. The poster was offset-printed by Kirkwood Printing, Boston. We'd like to thank Dan Vlahos for giving us the opportunity to design it.